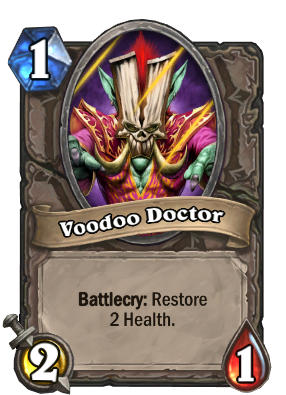 Voodoo is an oft-misunderstood art. But it is art. Just won me a game in arena. My opponent (mage) had 3/1 and 4/4 on the board, I had 3/5 on the board and North Sea Kraken in my hand and 1 hp. And I topdecked this. Luckly, my opponent didn't topdeck anything next two turns so I won. Will be used in the upcoming brawl. why is this disliked so much lol.. I like the golden animation of this card too tbh.